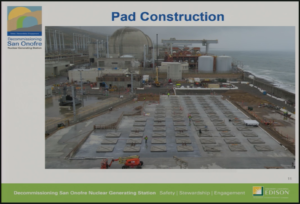 San Onofre — another Chernobyl? A terrorist attack that could endanger 8.5 million people. Who cares? A tsunami or earthquake that could spread even wider damage. Yawn. A potentially disastrous meltdown. Fuhgeddaboudit. A utility stock that zooms upward, paying fat dividends. Bingo! Finally, you are talking about something important. Wall Street has that view: the only thing important about utilities is whether their stocks and dividends go up. That is understandable. But, pathetically, that view is also shared by the California and federal agencies that are supposed to regulate utilities in the public interest. Tragically, regulators seem to be as fixated on rising utility profits as Wall Street is. Officially, regulators’ mission is to protect the public. Workers construct canisters to receive radioactive waste at San Onofre. The waste will be radioactive for the next 250,000 years. The canisters are warrantied for 10-25 years. For the past decade, I have watched as the California Public Utilities Commission, as well as other regulators, put the financial health of utilities ahead of the financial and physical health of citizens. During that period, I have also watched financial reports on the state’s three investor-owned utilities — Sempra Energy, Edison International, and Pacific Gas & Electric — emanating from Wall Street. I can’t remember seeing discussions of those utilities’ well-publicized attempts (usually successful) to fleece or endanger the population: Edison’s shifting most costs of the San Onofre fiasco to ratepayers, Pacific Gas & Electric’s negligence leading to the San Bruno explosion, Sempra’s mismanagement worsening the disastrous 2007 fires, Sempra’s carelessness leading to a major gas leak at Aliso Canyon, and, potentially most disastrous, Edison’s plan to bury 3.6 million pounds of deadly nuclear waste 108 feet from the water at San Onofre State Beach Park. Wall Street generally pays no attention to such calamities because it knows that regulators will give the utilities a gentle and Machiavellian wrist slap — say, making a big deal of slapping a fine on the utility, then granting the company a fatter-than-expected rate of return that will cover the so-called fine — and then some. “We consider California a constructive regulatory environment,” enthused investment research firm Morningstar in its May 2 report on Sempra. In the first two pages alone, there were five references to accommodative state regulation. On the next day, Morningstar had five laudations in the first two pages for Edison’s regulatory environment. In neither report was there one mention of both companies’ possibly expensive problems. Southern California Edison, part of Edison International, owns almost 80 percent of San Onofre. San Diego Gas & Electric, a unit of Sempra Energy, owns 20 percent. On May 17, a group called Public Watchdogs came out with a 450-page study of Edison’s frightening plan to bury nuclear waste near the water at North County’s now-shuttered San Onofre nuclear plant. A disaster there could release 40 times the radiation unleashed at the Chernobyl disaster in the Ukraine in 1986. According to Public Watchdogs, the San Onofre plutonium waste could be deadly for 250,000 years but will be stored in thin-walled canisters warrantied for only 10 to 25 years. 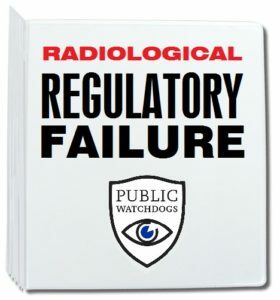 The study, called “Radiological Regulatory Failure,” pins much of the blame on the federal Nuclear Regulatory Commission and Federal Emergency Management Agency (called FEMA). The report points out that, thanks to federal laxity, Edison doesn’t have to do emergency planning outside of the San Onofre perimeter; doesn’t have to do terrorist preparedness with local police; is not required to notify the public within 15 minutes of a radiation release; and has no requirement to sound an air-raid siren in a nuclear emergency. Only three people will patrol the nation’s largest privately owned radioactive nuclear waste dump. And get this: under consideration is “reduced requirements for Drug and Alcohol Testing” for those three people guarding the facility that has millions of pounds of nuclear waste buried near the ocean. Three stoned monitors would be almost an invitation to terrorists. Late last year, San Diego attorneys Maria Severson and Mike Aguirre filed suit against the California Coastal Commission, which has approved the volcanic burial-by-the-beach. (Edison was named as a real party in interest.) 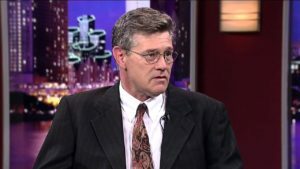 As the suit tells in detail, and Aguirre explains in an interview, “Edison placed irreconcilable demands on the steam generators; they wanted them to last longer and produce the same amount of power. They limited the design to avoid regulatory scrutiny.” Those are just the kinds of shortcuts Wall Street loves. Generator equipment built to last 40 years sprung a radioactive leak in less than a year, and ultimately, Edison closed down the entire San Onofre operation. Then Edison had a secret meeting with Michael Peevey, at the time head of the California Public Utilities Commission and formerly Edison’s president. This was highly illegal, but thanks in great part to gubernatorial duplicity, the utility and the purported regulator got away with a plan to screw ratepayers and fatten Edison. 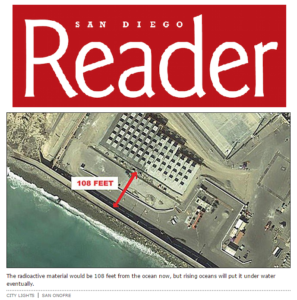 Result: ratepayers got stuck with $3.3 billion of the $5 billion tab for decommissioning San Onofre, though ratepayers had absolutely nothing to do with the calamity. It was all management stupidity and greed. Thus, shareholders should have paid the entire $5 billion. Aguirre’s objective is to see the San Onofre nuclear waste moved. Aguirre and Severson believe that storage locations for the waste can be found — probably in Arizona or New Mexico — and transportation won’t be a problem. In April, Edison agreed to launch negotiations with Aguirre and Severson on whether the radioactive material should be moved. However, “Edison has not backed off on construction” of the project, says Langley. “They are going great guns to complete it.” Edison’s scheduled talks with Aguirre and Severson “seem to me a big stall by Edison.” Aguirre disagrees. Wall Street has listened to Edison’s lies. Is it invited? Published for archival purposes under the fair use provision of U.S. Copyright law. Please read the original story as it appeared in the San Diego Reader, here. New Video: Is Edison’s Community Engagement panel a Sham?